AngularJS Internationalization is possible by numbers and dates done internally. Few of the AngularJS filters gives foundation to internationalization. For example, currency and date filters support for internationalization like below. The filter takes the below values defining the way to format the date. 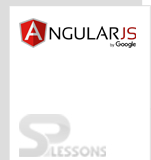 To initiate locale (language and country) to AngularJs, include the respective AngularJS locale file. Below example shows the way to include the Danish locale. AngularJS Internationalization refers to setting the date, time or currency as per the local standards. Data, Currency and Number filter supports Internationalization.